Elvin Hayes is one of the greatest power forwards in NBA history and is remembered for his all-around game and overall durability. Although he does not get the same hobby love as other Hall of Fame players from the 1970s, Elvin Hayes cards have a loyal following. Shop for Elvin Hayes Cards on eBay. Born and raised in Louisiana, the "Big E" traveled to the University of Houston to play college basketball. After a very successful run with the Cougars, including a trip to the Final Four and a win over Lew Alcindor in a game dubbed the "Game of the Century," Elvin Hayes moved on to the professional ranks. 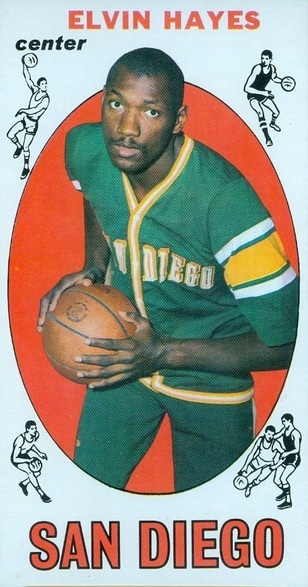 He was selected in both the ABA and NBA Draft, but elected to go with the San Diego Rockets and the NBA. Elvin Hayes did quite well in NBA, earning 12 straight All-Star selections and winning the scoring title in 1969. Hayes spent the majority of his career with the Baltimore/Washington Bullets and helped the team claim the 1977-78 title. After spending his final seasons with the Houston Rockets, Hayes retired in 1984. He was later inducted into the Hall of Fame and named to the NBA's 50th Anniversary All-Time Team. From a collecting perspective, Elvin Hayes picked a good time to play pro basketball. The majority of his 16-year career is documented with major releases and collectors have a solid mix of affordable vintage options. A regular signer in modern basketball products, the earliest Elvin Hayes autographs were released in the 1990s. However, relic cards are much less common for the former great. Other than some food-related issues, 1969-70 Topps is the earliest card available for Elvin Hayes and his official rookie card. The tall boy design is likely familiar to vintage collectors as the set is also home to the rookie cards for many Hall of Fame players, including Lew Alcindor and John Havlicek. Although Hayes' values don't match the top rookies in the set, the card does see good interest and high-grades command a premium. Also found in 1969-70 Topps, these Ruler inserts feature a cartoon drawing of Elvin Hayes and check in at just under ten inches in height. The thin paper design means that they are a bit tougher to find in good condition.